Home/Knowledge Base/Email/How to set up your email account in Windows Live Mail? 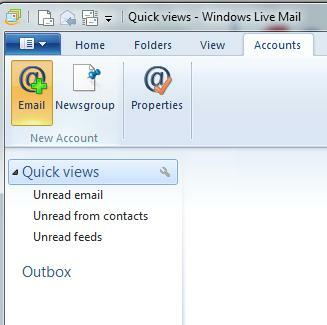 How to set up your email account in Windows Live Mail? 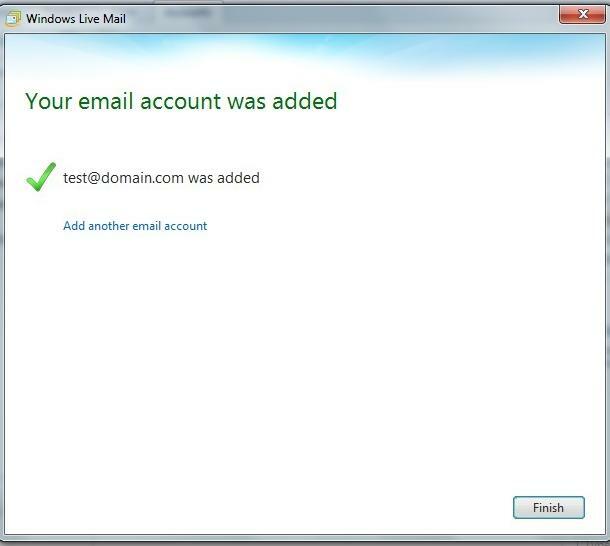 If you wish to access your email account with Windows Live Mail, please follow the instructions below email setup with Windows Live Mail (SSL). 2. Select “Accounts” at the top section and click on “Email“. 3. A new window will pop up where you will have to mention the complete email address, password and the display name for sent messages. Also please tick the manually configure server settings option and then click Next. 4. Upon clicking Next, a new window pop up. 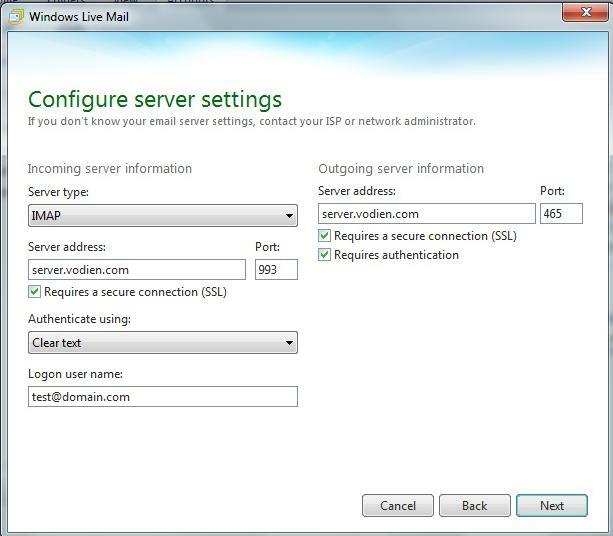 Under Incoming server settings, you may have to select Server type as IMAP, Server address as mail.domain.com and port as 993. Authentication as clear text and Login username as your complete email address. In the Outgoing server settings, you may have to enter mail.domain.com and port as 465. Also tick the options ‘Require ssl connection‘ and ‘Requires authentication‘. Alternative server address is server.vodien.com. This is only an example and may differ on what is your server. 5. Finally click next and your mail account is created. 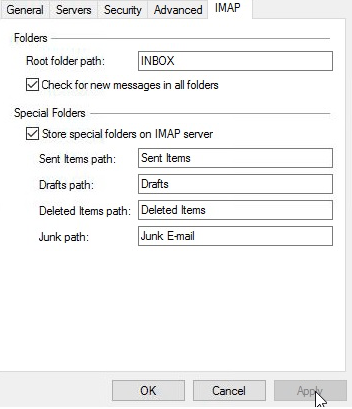 NOTE: Please ensure that the Root folder path is set to “INBOX”. 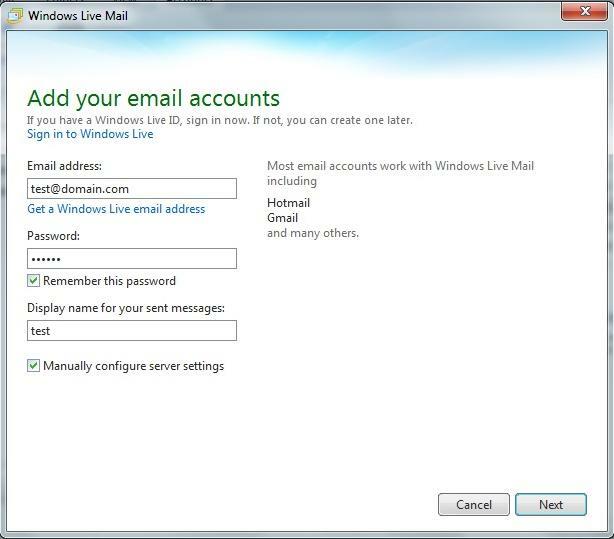 If you wish to access your email account with Windows Live Mail, please follow the instructions below on how to set up email with Windows Live Mail (Non SSL). 4. Upon clicking Next, a new window pop up. Under Incoming server settings, you may have to select Server type as IMAP, Server address as mail.domain.com and port as 143 , Authentication as clear text and Login username as your complete email address. 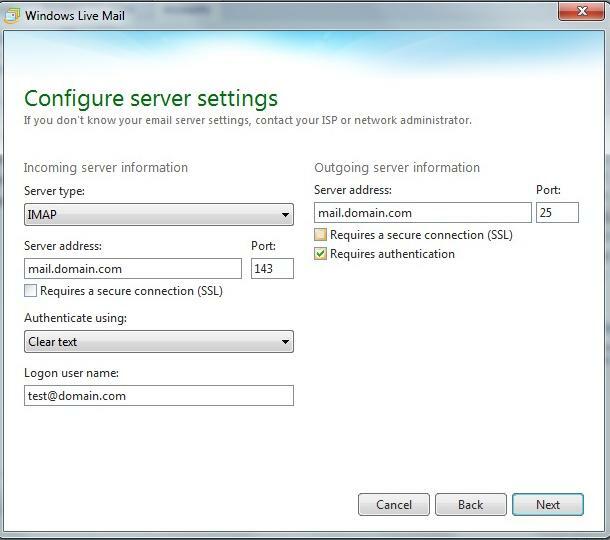 In the Outgoing server settings you may have to give Server address as mail.domain.com and port as 25. Also tick the option ‘Requires authentication’.